A hook wrench is very useful when a chuck or faceplate gets stuck on the lathe spindle nose. They have to be secure, particularly if you run the lathe in reverse, so can get too tight to remove easily. Lathe manufacturers don’t always cater for this very well. They may provide a tommy bar, but these are often unsatisfactory. Unless the bar is stout it will bend, and if the hole for it is shallow the metal around it will distort. Soon, the bar becomes too loose. A hook wrench causes much less distortion. They may not be easy to find in the right size, but adjustable ones are available. It’s easy to make a hook wrench from steel rod. The first step is to make a short peg at one end that will hook into the tommy bar hole. I hot forged mine by making the end of the rod red hot with a blow torch, then hammering it into an L shape. I used the square edge of the vise jaws to make the bend a tight right angle. Using a file, I shaped the short arm to fit the tommy bar hole and trimmed it to about 1/4″ long. The arm needs to be at a right angle to prevent it slipping. Another method would be to drill a cross hole in the rod and rivet in a short bit of smaller rod. Or you could weld a bit onto the end of the rod. Then the rod has to be bent to wrap round the chuck. It should go round at least a quarter of the circumference. The rest of the rod forms the handle. This is best done with the metal red hot. You need a large burner or a small homemade forge. But the rod could be bent cold if you have a heavy vice and it isn’t too thick. Make the bend to match the curve of the item if possible. It is better to have it too tight than too loose. High carbon steel can be hardened and tempered. 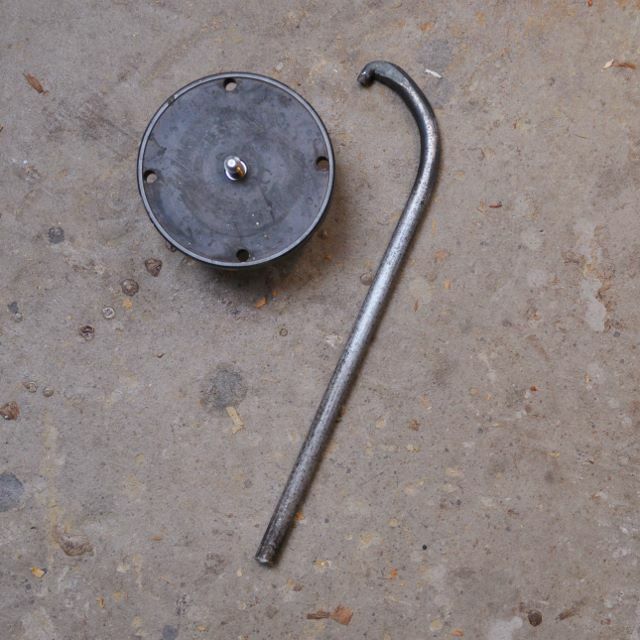 I used a bit of scrap mild steel rod about 3/8″ thick, unhardened. It seems to be quite strong enough for light duty. This hook wrench easily loosens my screw chuck – just a tap on the handle does the job.